Having first tried it out on my daughter’s XP SP3 system yesterday evening, I installed TuneUp Utilities 2010 on my latest XP SP3 box a few hours later. Installation again was hassle free and slick. I like their install. It is bright, breezy and keeps you engaged. That is a PLUS in the TuneUp Utilities 2010 column. Well done. Ran 1-click maintenance. Told me I had 265 registry errors and 2 unnecessary start-up items. It fixed my 265 registry errors. But, insisted that the registry did not need compacting. I do not agree with that. 265 fixes is a fair amount. I want my registry compacted after that. I ran 1-click maintenance again. So all I had done was run 1-click maintenance, fix the reported errors … which told me that it fixed 265 registry errors (and two start up items) … and then run 1-click maintenance AGAIN. Told me I had 46 registry errors! I have seen this happen with System Mechanic too, though a 17% resurgence is high. Not good. Not happy. It said it fixed all. I couldn’t have got 46 new registry errors that soon. I hadn’t run anything other than TuneUp Utilities 2010. So this has to be checked. It still said I did not need my registry compacted. Poppycock. By now, I needed a registry compact. Could NOT get it to compact the registry. I was getting kind of frustrated. I just could not find a way to do a registry compact (or defrag as some call it). Then lo and behold I found it. << smile >> You have to get to it from the START button. There are TWO (2) TuneUp Utilities entries in the START button ‘Program’ menu. One is a folder. Click on that. You get another folder called ‘All Functions’. BINGO. All the tools are there. Lucky I found that. I was actually looking to see if they had provided an UNINSTALL ‘link.’ They hadn’t. Naughty, but neither does System Mechanic. I guess that is a part of their customer retention strategy. make it as difficult to uninstall as possible. They might not like us, BUT they also can’t get us off their PCs. Anyway … that was bittersweet. I find the tools, when I go looking for UNINSTALL. I did a registry compact (or ‘defrag’) as they call it. Similar to System Mechanic. Needed a restart. Not the same, but similar narrative as to what was happening during the compact. The TuneUp Utilities messages are slightly more user friendly than the more technical ones generated by SM. Told me my registry was 7% fragmented. So why the hell did I have to jump through hoops to have it compacted. This aspect needs to be fixed. On this system I asked it to do a full disk check. It scheduled Windows to do it, using the standard ‘DOS’ CHKDSK. This is exactly the same as what System Mechanic does. So on that score TuneUp Utilities 2010 and System Mechanic 9.5 are on a par. But by now I had seen a theme. TuneUp Utilities 2010 is an intentionally ‘dumbed down’ product. System Mechanic has seen the light. I could be wrong, but I get the impression that TuneUp Utilities 2010 is focused entirely at the PC amateur market — i.e., PC users that get disk capacity and memory confused and have never heard of a registry outside of where they go for their shotgun weddings. Nothing wrong with this. Probably 90% of Windows users fall into this. My 81 year old father falls into that as does my 9 year old daughter. They just want a tool that will do everything automatically to fix their PC and make it faster. I have nothing against that provided that it does not violate the Hippocratic Oath for PC tools. FIRST, DO NO HARM. Right now, I am not sure about TuneUp Utilities 2010. My PCs still work but not sure what they did. Oh, their logs need to be more detailed. But for now, there is only one BIG thing I want. 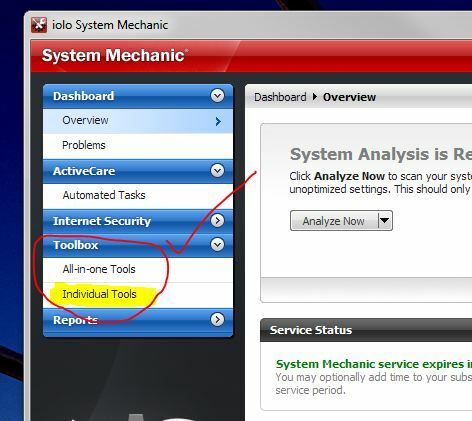 Make it easier to find and invoke the individual tools à la System Mechanic. Put it as an option under MAINTENANCE. So that is it for now. I will do more testing. Right now I am ambivalent. Not sure whether it is good, bad or indifferent. Windows 7: Is TuneUp Utilities 2010 A Viable Alternative To System Mechanic 9.5.5? I have never really used TuneUp Utilities though I kept on hearing about it in the last few months vis-à-vis tools for tuning up PCs running Windows 7. Yesterday I got an email from the TuneUp Utilities folks (actually their PR firm) asking whether I would check out TuneUp Utilities 2007. With six PCs running Windows in the house it wasn’t a bad idea to check out a new tool, especially since the System Mechanic license on my daughter’s XP system is ready to expire next month. Now, remember I do not use System Mechanic Pro. 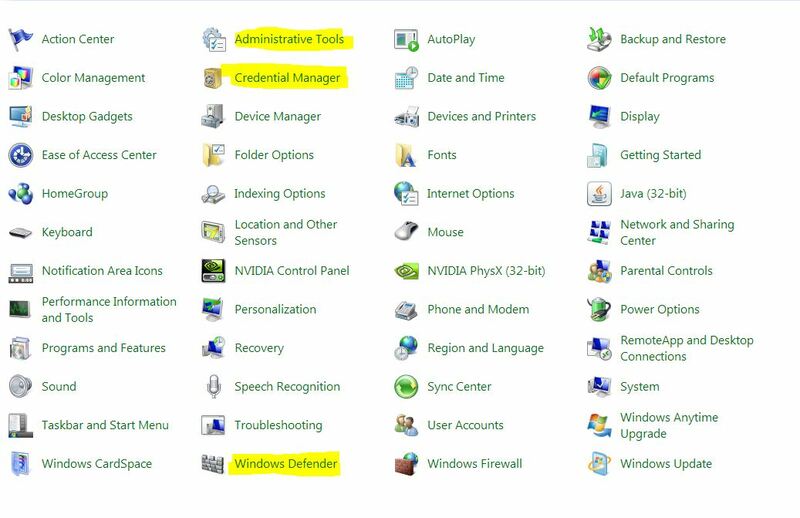 I only use System Mechanic; i.e., I do not rely on System Mechanic for anti-virus or spyware protection. I use Avast! 4.8 Professional on my systems (despite the hiccups), while the other PCs have various flavors of AVG. [My wife prefers AVG to Avast. What can I say?] So in my case TuneUp Utilities could be a viable alternative — given that TuneUp Utilities, true to its name, only does system tune-up functions and stays away from the anti-virus stuff. The install was quick and painless. I am still not used to it. I tried the new Turbo option. Clicked around a bit before I found the 1-click optimization. Tried it. Told me that it found and fixed 430 registry errors. Hhhmmm. Hhhmmmm! I have System Mechanic on that PC and I had cleaned it out, myself, just two weeks ago. Find it hard to believe that there could have been 430 new registry errors in two weeks … on a system that is not that heavily used … and used mainly for Web browsing. I will have to see. Yes, I have heard folks tell me that TuneUp Utilities finds registry errors ‘missed’ by System Mechanic. You can already see it coming. Yes, I fired up System Mechanic … which was now at 9.5.5. 65 registry errors for a start. I knew that that was coming. I had heard stories about System Mechanic and TuneUp Utilities never being able to agree when a registry was fixed. People tell me a lot of stories like this. I decided to start with a level playing field. I restarted … since a lot had happened. I ran TuneUp Utilities. It said 16 registry errors. OK. I see that with System Mechanic. Windows itself creates invalid entries. So I was cool. I looked at the supposed errors. TuneUp Utilities, as far as I can work out at present, doesn’t show me the complete string as does SM. So, I was a bit at sea. With SM I kind of know the ‘strings’ and what to expect. Did 1-click Maintenance using TuneUp Utilities and told it to fix everything. Fixed the registry. Said it wanted to check the C-drive. Said OK. A bit confused. It showed a DEFRAG type graphic though it wasn’t doing a defrag. It was just checking the drive. But, I can live with that. It was kind of 1960s psychedelic and I am a product of the 60s. When it finished it said, drive was fine. Which is what I had expected. I had really cleaned out and optimized this system for my daughter on Dec. 30. Ran TuneUp Utilities and 1-click Maintenance AGAIN. Came back and said NO PROBLEMS. Bingo. Guess what. I ran System Mechanic 9.5.5 Deep Analysis. The suspense must be killing you. Sorry. System Mechanic told me that my PC was in Poor Health. I am glad it didn’t tell me to take it to the nearest PC doctor. Eight (8) problems. Yes, the C-disk was fragmented. I had the inescapable SM clutter. My C-drive had a fault! And I had 76 errors. Not Funny. It is the registry errors that bug me. I don’t put much stock in System Mechanic’s reporting of disk fragmentation — any more. I think they are using the old metric. They have also given me too many ‘false positives‘ on disk errors — though that was pre 9.5.3 with Windows 7. It was like watching MSNBC and switching over the Fox News (which on my cable are on adjacent channels). Same news story different numbers. But at least when it comes to MSNBC vs. Fox News I know which numbers I would trust. Next step. Going to install TuneUp Utilities 2010 on my latest (refurbished) XP. That is nice machine. Fast. Clean and I have a fully-paid up System Mechanic 9.3.3. [I haven’t powered it up THIS YEAR.] So stay tuned. I will get to the bottom of this. So as Churchill used to say to FDR, I have no choice but to ‘KBO’. Good luck.